When Grandpa died, most of his books and writings went to my father and after Dad died, most of the books and writings went to his younger brother, Al, and I got what was left. Some years back I found two letters among my grandfather’s collection. One was in a small envelope, the type that usually holds small, personalized handwritten memos of thanks or congratulations and the other was included in Grandpa’s Souvenir Anniversary & Retirement Program. I remember the letters being almost poetic in their flow and perhaps that’s one of the reasons Grandpa kept them. He recognized not only Taylor’s talent but also his commitment to God’s Word and God’s people. Taylor was some 23 years Grandpa’s junior and I am sure each saw a bit of themselves in the other. You will notice the tone of the letter below places the respect and admiration between the two on display in their greeting, “my old and dear friend” and closing , “Cordially, as ever, Gardner Taylor”. From 1926 to 1938, my grandfather, Rev. 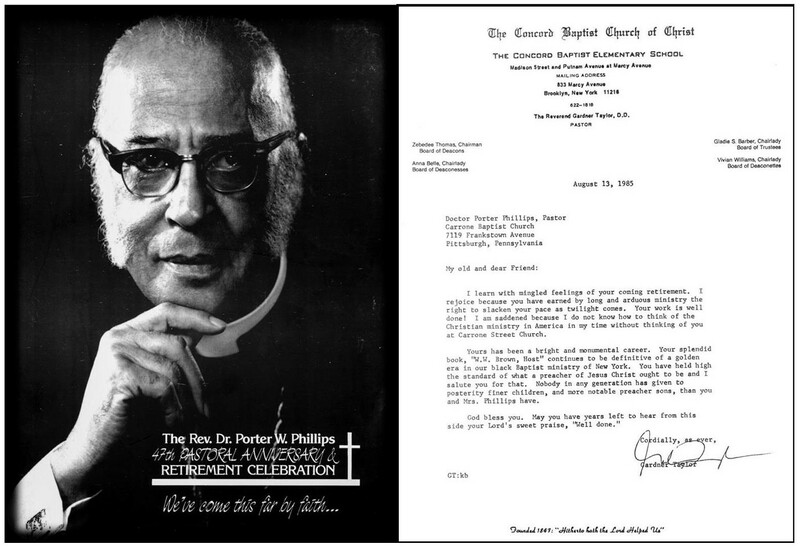 Dr. Porter W. Phillips, Sr. was pastor of the Brown Memorial Baptist Church in Brooklyn, New York. One short mile away from Brown Memorial was Concord Baptist Church of Christ where Rev. 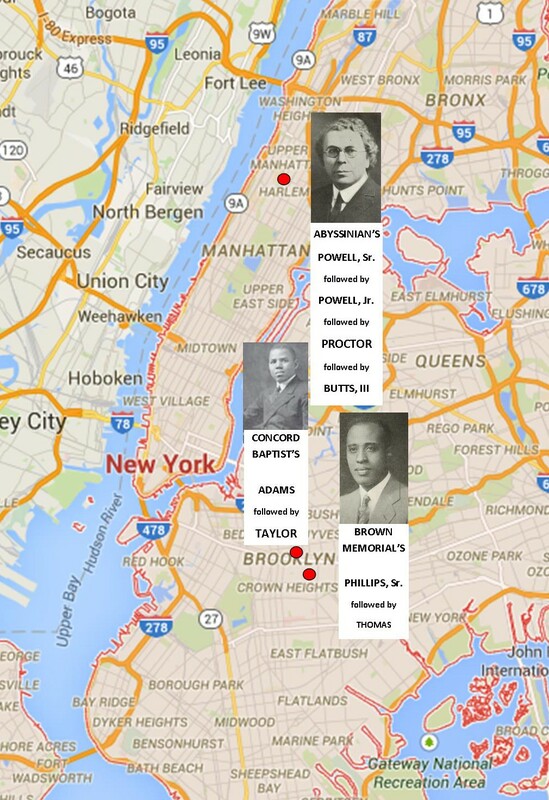 Dr. James B. Adams was pastor and about 15-20 miles away was the Rev. Dr. Adam Clayton Powell, Sr. at Abyssinian Baptist Church, in Harlem. They were three dynamic preachers ministering to a diverse city through the Great Depression, to a New Deal and beyond. A change of leadership was on the horizon and a new generation of “Joshuas” was waiting in the wings. In 1938, Grandpa would go on to pastor what became Carrone Baptist Church in Pittsburgh, Pennsylvania where he pastored for 47 years (he retired in August 1985 and died in January 1986), but not before leaving his mark at his first pastorate, Brown Memorial Baptist Church. Under my grandfather’s 12 year leadership the church grew in membership and finances helping to set the stage for Rev. Dr. George W. Thomas who went on to grow and lead Brown Memorial for 35 years. In 1937, Rev. Dr. Adam Clayton Powell, Sr. stepped into the background and Rev. Dr. Adam Clayton Powell, Jr. burst onto the spotlight at Abyssinian Baptist. Little more than a decade later, Concord Baptist Church of Christ would call a 29 year old and no less dynamic, Rev. Dr. Gardner Calvin Taylor, to help heal and lead the church through the fire both literally and figuratively for the next 42 years. Though Grandpa had left the area, New York was still near and dear to his heart. Having served as Secretary and eventually, President of the Baptist Minister’s Conference of Greater New York and Vicinity, Grandpa remained close with the ministers in the area. Grandpa had also written a book entitled, “W.W. Brown, Host”, a biography about the life of this former slave, mentor and founding pastor of the Metropolitan Baptist Church, also in Harlem (about a half mile from Abyssinian). It is in this context that he and Dr. Taylor’s “mutual admiration society” began to flourish but what cemented their bond of friendship was a trip to the Holy Land in 1947 just prior to the beginning of Taylor’s tenure at Concord Baptist. The ship set sail for about one month and nearly killed my grandfather who fell deathly ill on the voyage. Though he had lost a tremendous amount of weight he was revitalized almost as soon as he set foot on the land where his savior walked. I can only imagine the conversations they had and the witness they shared on such a life changing trip. After my dad’s death in 1993, I began to pore through his journals, books, letters and writings as well as those of my grandfather and uncles. I began to pay close attention to the iconic names I read in the world of politics and/or religion and their relationships to members of my family. As I grew older, whenever possible, I would seek them out and introduce myself. I had some success with the likes of Rev. Dr. Wyatt T. Walker, former Governor of the State of Virginia, Doug Wilder, former Congressmen Julian Bond and Walter Fauntleroy and Rev. Jesse Jackson and Rev. Dr. Jeremiah A. Wright, Jr. were good friends of Dad’s with whom I am still in touch with to some small degree. Unfortunately, my meeting of Rev. Dr. Samuel Proctor was overshadowed by the fact that he was delivering my father’s eulogy and while I am sure it was beautiful, for me, it was all a blur. However, my father’s only sister, Marie and her husband (my uncle and first Black President of the National Council of Churches of Christ in the USA), the Rev. 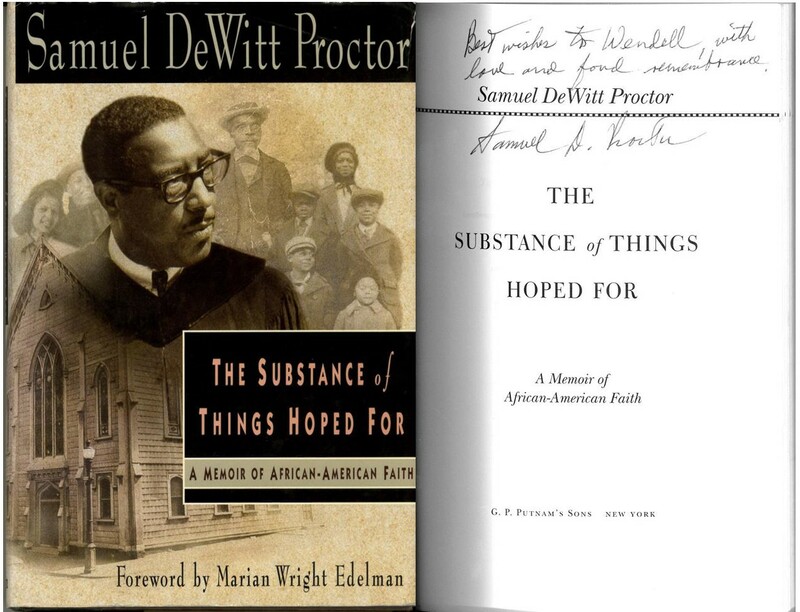 Dr. W. Sterling Cary, knew Dr. Proctor quite well and were kind enough to secure for me an autographed copy of his last book, “The Substance of Things Hoped For: A Memoir of African-American Faith”, while taking him to the airport after a visit to Chicago. I am more than certain some couch time and even a rookie therapist would explain my efforts to meet these iconic servants as an attempt to connect or reconnect with my father and grandfather or my uncles who have gone on before me. Somewhere in my subconscious lives the notion that if I can physically touch those who worked “in the vineyard” and shared space with my loved ones … if I could share space and time with those who fought all the battles necessary for me to grow strong enough to fight my own … if I could physically touch those who touched those… who touched me so deeply … if I could continue to uncover more about them then perhaps I could discover more about me. You know, life has a way of moving at breakneck speed while we are so busy meeting, planning, coordinating and organizing. We are so busy, “getting ready to … commence … to begin … to start” working on something that time and opportunity will often pass us by and all that was once “right on time” becomes “too late”. I had been asked to lead a revival during Holy Week at Heritage United Church of Christ in Baltimore. For those of you who have never had to lead one, a revival is a lot of work! 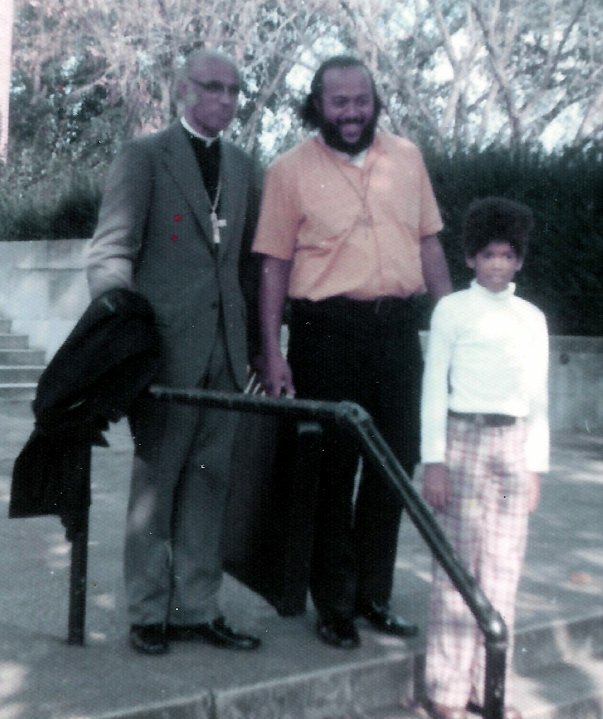 In the midst of working on that my spiritual father and the pastor who licensed me to preach, the Rev. Dr. Howard Allen Chubbs, lost his battle with cancer. It created a huge void in my life but I still had to prepare for this revival that was now a little more than a week away. I was honored to be given the opportunity to take part in Rev. Chubbs’ Homegoing service and I thought I would now need the robe I had been meaning to buy for years but procrastination had outsmarted me at every turn. I did attempt to place a rush order but they would need more time than I had to deliver, so I checked to see if I could borrow a robe from some local pastors. One pastor, who collects robes like my Dad collected crosses, came to pick me up and take me to his church to try on a couple. On the way from my job to the church to check out the robes the pastor points and says, “Gardner Taylor lives in that building right there”. The convalescent home was less than three miles from where I worked. I had passed the building going and coming to work for over a year! I was in utter disbelief but pleased that I finally knew where this great man was located. I got the robe and thanked the pastor as he dropped me back by my office. I should have gone to visit that day … but I didn’t. I needed to get through Rev. Chubbs’ funeral and the revival before going to see the great Gardner Taylor. A week passed and with the funeral now behind me I went on to Baltimore to visit with Mom and finish preparing for the Holy Week revival. On the first night of the revival, the always supportive Rev. Vaughn was in attendance and I told him, from the pulpit, I had finally found where Dr. Taylor lives and that it was only about 3 miles from my job and that I was going to see him as soon as I got back in town, which would be Easter Monday. I finished the revival on Wednesday, continued to enjoy visiting with my mother on Thursday and left to return to Greensboro on Friday afternoon. Easter Sunday was bittersweet as it was the first Easter in almost 50 years that Rev. Chubbs wouldn’t be there but just a few miles away, God was busy making preparations. After rising to go to church on Easter Sunday morning and having dinner with his wife that evening, Rev. Dr. Gardner C. Taylor went on to join that “great cloud of witnesses” on Easter Sunday evening. On this particular Resurrection Sunday not only did Jesus rise to be with The Father but He took Gardner Taylor along with Him. In an interview with Charlie Rose in 1999, Dr. Taylor said almost prophetically, “poetry must insert itself at times where prose will not speak”. Now, tell me, how poetic is that? Well done, good and faithful servant, well done! ← Right Thing. Wrong Place, Wrong Time.